Cute Hedgehogs Found Guilty of Wrecking the Furniture! At the moment, we have around 60 hedgehogs staying with us for winter and there will probably be more to come! They've all come to us because they weren't big enough to survive hibernation. Most of them spend their nights in our heated 'orphan shed', where they have more space to move around. 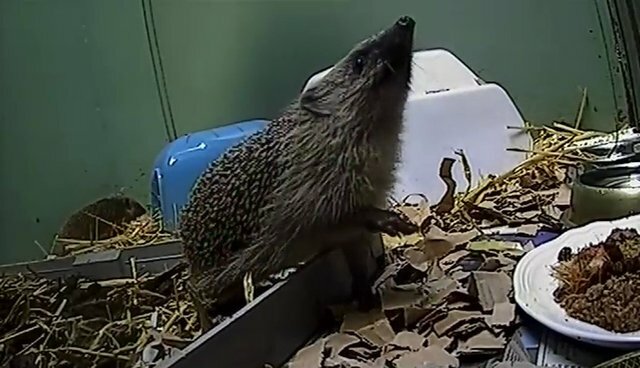 Our webcams are very entertaining and you can tune in 24/7! (free and easy to register) If you catch any interesting or funny hedgehog scenes, please let us know and we will feature the best clip, with a shoutout for you! Let us know the name of the camera, the date, the time and your name! We are moving towards colder weather, so its the time to keep an eye out for wandering hedgehogs. If you find one that is less than 600g, please take it to your local wildlife centre. PLEASE DONATE - Just £3 from every viewer can help us save many more animals! - Thank you for your support.